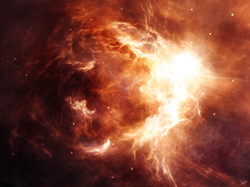 A nebula, the beginning of all stars. Antares began as a nebula, a grouping of cold dust and gas, in space. As gravity pulled the nebula together it became a very dense cloud of gas. Dense regions in this cloud collapse and form a protostar. So Antares life began as a large cool mass of gas. 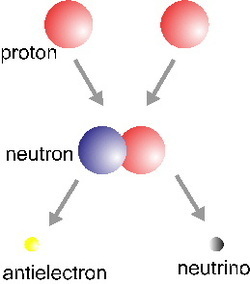 As this gas contracts the temperature rises until they become hot enough so that nuclear fusion can occur. Nuclear fusion within a star. Antares began as a blue star. It was extremely hot, with average temperatures of 20,000-45,000° F. It was formed from very, hot, large, and dense cores. It takes them about 10 million years (a relatively short time in terms of stars) to use up all their nuclear fuel. At this point, a blue star slowly expands to become a blue supergiant, or an even larger blue-white supergiant. How did Antares go from a blue giant to a red supergiant? As Antares got older, it started to run out of its hydrogen fuel. When the burning of hydrogen in the star's core begins to slow down, the core gets more compact. As the center gets smaller it starts to heat up again. When it gets hot enough it will start to burn helium. Once ignited, helium burns much hotter then hydrogen. The additional heat pushes the outside of the star much further than it used to be, making the star much larger. As the star gets hotter its outside stretches out further. The life cycle of our star. It is currently at point three, and will in the end become a black hole.